A bus company has launched an appeal over a ruling that a double-decker bus involved in a collision which killed five people had faulty brakes. 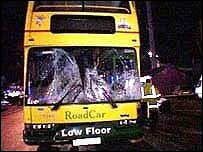 The bus struck a group of pedestrians outside the Fantasy Island resort in Ingoldmells, Lincs, on 11 April 2004. Lincolnshire RoadCar was convicted in August of breaching safety provisions. The firm was fined £2,000 but launched a formal appeal on Monday at Lincoln Crown Court. A full hearing will take place next month. The company had denied an offence of using a motor vehicle with defective brakes during the case at Skegness Magistrates Court on August. Magistrates were told the brake fault was found by police investigating the road deaths, but it had not caused the crash. The crash claimed the lives of Joanna Warren, from Leicester, her sons Jacob, five, and four-month-old Leyton, and Richard and Paula Rhodes, of Mansfield. Last month bus driver Stephen Topasna, 51, formerly of Bridge Street, Louth, denied five charges of causing death by dangerous driving when he appeared at Nottingham Crown Court. He was bailed for another hearing to take place at a later date.